Database accesses are evenly distributed across the different datafiles, etc. eG Enterprise includes extensive monitoring capabilities for Oracle databases. 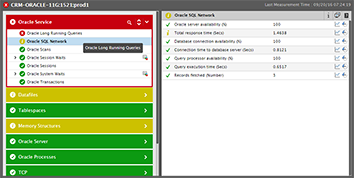 A single eG monitoring agent is capable of monitoring all of the Oracle database instances being executed on a system. Monitoring of the Oracle database instances is performed non-intrusively, with administrators having the option of configuring whether the monitoring is to be performed in an agent-based or agentless manner. eG Enterprise's 100% web-based architecture, allows geographically distributed Oracle database servers to be managed from a central manager. 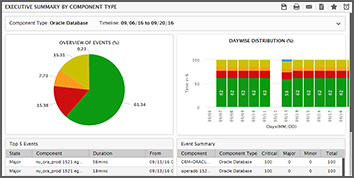 Administrators can view and analyze the performance of their Oracle database servers in real-time over the web. To avoid overwhelming the administrator with a ton of performance data, eG's Oracle monitor includes a specialized model for an Oracle database server. By viewing the layer model of an Oracle database server, an administrator can quickly determine which layer(s) of the database server is causing a problem. Is the Oracle database server available for servicing requests and what is the response time for a typical request? How many users are accessing the Oracle database currently? Who are the active users? What are the current top 10 SQL queries in terms of resource utilization? What is the commit and rollback behavior of the applications using the Oracle database? Have there been any recent errors/events in the Oracle alert log? What are they? Is there heavy contention for the rollback segments? Is there contention for locks? Is a specific application holding a lock for a long time? Which lock(s) are these? Are the library cache, dictionary cache, and the data buffer cache adequately sized? Is there any full table scan happening on the Oracle database server? If so, how frequently? Are any of the tablespaces reaching their storage capacity? Is the load adequately balanced across the tablespaces? Is the disk I/O (read/write) being balanced across the datafiles or is there a particular hot datafile that is handling all the requests? Is the Oracle redo-log buffer sufficiently sized, or is there a large number of requests waiting for redo log space? Is there any invalid object in the database? Which ones? Which objects have been recently modified and when? Are there objects that have reached their maximum extent? Which ones are these?